MUFF WIGGLER :: View topic - 4u Serge type Quantizers? i know the Clee is a very convenient quantizer for it´s 8 channels. Which other options are around? 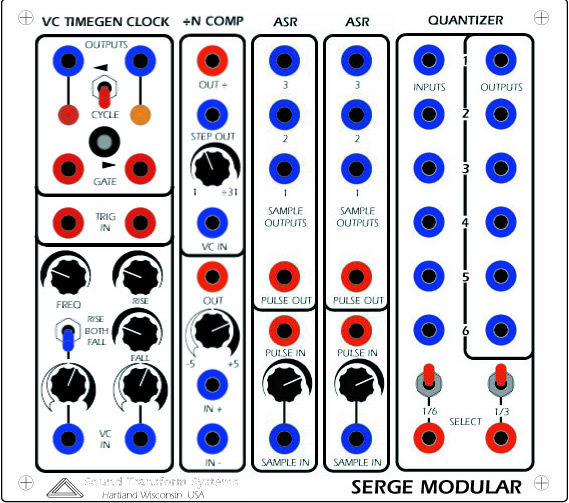 i´ve seen a Serge one in a STS panel but what about single modules? impressive panel , but i´d be more than happy with just the ASR, ACTIVE PRO and small QUANTIZER ( and maybe an extra vca) in a 4x4 module, that would be the perfect complement to their available set of 4x4 modules. When it has been annouced it was just that, a panel proposal. Meanwhile we had some ideas and changes. So yes, the Sequencr panel will come. I hope we'll have it ready for the Superbooth. Good news, looking forward to hear such good news. Fingers crossed. "I have done a 4U serge LW version of the OC and ModularAddict and SynthCube both want to sell PCB/Panel sets for the 4U crowd." don't know much else, but it sounded like 'available soon'.